It can often seem like every day is a battle with eCommerce. You spend countless hours trying to beat out your competitors for that top Google spot. Compete against one another for a mention and endorsement from your industry’s biggest authority, and are forever spying upon one another to steal the latest, greatest tactics to increase revenue. It’s a never-ending battle, but it’s never consistent. At certain times of year the potential for driving revenue hits an incredible high and so the battles you fight against your competitors become that much fiercer. And right now, we’re in the run-up to one of the biggest battles of the year. Black Friday weekend is one of the biggest opportunities for eCommerce companies across the globe. Every year it sees a huge increase in sales and shows no signs of slowing down. For brands that have taken the time to prepare, the Black Friday through Cyber Monday weekend is a veritable treasure trove. In this four day weekend, you can see your revenue easily double. However, it’s not as easy as running a sale and hitting your abs with an email blast. You’ve got to have the right strategy and know all the best tips and tricks if you’re going to bat your competitors and attract the lion’s share of the market. To help you achieve exactly that, we’ve put together a couple of tips for you to follow. It’s a saying which more business leaders and store owners need to embrace because it accurately explains the need for immediate action. Sure, the best time to start this year’s Black Friday campaign planning is as soon as the previous year’s Black Friday weekend is over. However, if like many stores you failed to get the ball rolling then, there’s no reason to worry. All you have to do is commit to making some progress on this year’s Black Friday campaigns today. The more prepared you are, the closer you’ll be to experiencing an easy, profitable Black Friday this year. Most stores tend to start their promotions in early November. 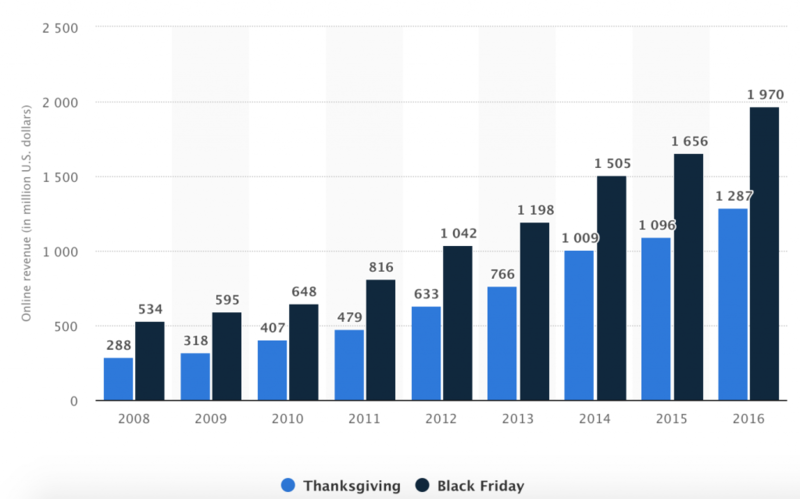 This isn’t bad, but when you consider customers begin Black Friday shopping and research before September, you can see how it’s a little late. The majority of shoppers actually begin their research in earnest during October which is really when you should start rolling out your notifications and announcements. Black Friday might only run for the weekend, but your customers are looking forward to it months in advance. Don’t slack off and only attempt to rectify a lack of action at the start of November. It’s never too early to set plans and get things prepped for the biggest eCom weekend of the year. Your traffic on both Black Friday and Cyber Monday is going to skyrocket. 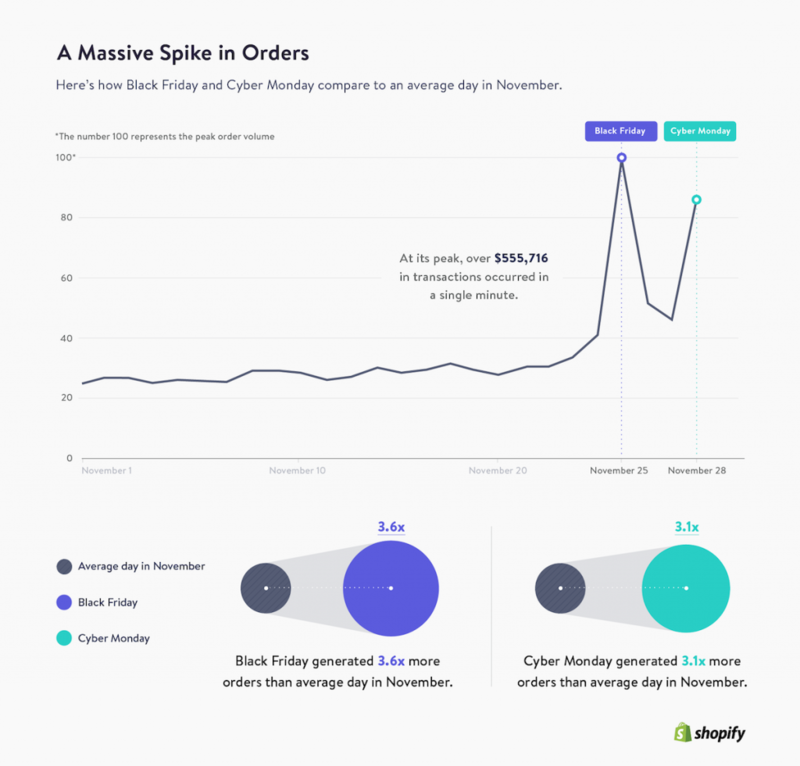 Shopify reports the level of order traffic increased by 3.6x on Black Friday alone. Sounds great, right? Especially when $555,716 of transactions are being made in a single minute. But that’s only great if your store can handle that level of traffic and the huge number of orders. Make sure your store can handle that huge amount of interest without crashing. Every year there are reports of eCommerce stores buckling under the pressure of this increase traffic. If you’re running a Shopify store then this isn’t going to be such an issue as they go to great lengths to keep their servers running throughout. But it’s better to be safe rather than sorry. So, in the run-up to Black Friday use a tool like loadimpact.com to see if your store will be able to handle the huge amounts of traffic and sales that are coming your way. These stress tests need to extend beyond your site. You’re going to see a huge increase in orders which is going to strain your delivery and fulfillment channels. Make sure your delivery department is able to handle the increased workload. No point in selling 3x the product if 80% never make it to the destination and you have to refund those customers. eCommerce is a multi-faceted beast with numerous channels to promote your products and solicit sales. If this were any other time of year, I’d tell you to take your time. To focus on one channel, get that strategy down perfect and implement it before even considering dabbling in something else. But this isn’t any other time of year. This is Black Friday. At this time of year the more you can do to drive sales, the better. You’ve got to put everything else on hold so you can come up with a killer Black Friday campaign which builds anticipation in the run-up, and grabs sales during. Here’s how we’d recommend utilizing each and every channel. Email has long been the king of ROI, and it’s no different during Black Friday. In 2015, Custora reported email as the number one channel which accounted for 25.1% of sales. You’ve got to make sure you’re using it properly. Here’s the basic plan we’d recommend you implement. If you haven’t already, segment your users based on previous purchases and engagement. This will help you push only the most relevant offers to them. One month out send an email explaining the basics of your promotions. Something like “Get ready for Black Friday and Cyber Monday! We’re giving you up to 70% off selected items!”. Two weeks before start teasing with specific items. If you’ve segmented your users, try to offer more personalized offers of products they’d better enjoy. One week before, build that desire with emails that detail the exact savings and products they can grab. Start with two emails both 48 and 24 hours before to remind them that the sale is soon to go live. On launch day, send an email that lets the user know they’re missing out on offers right now. Towards the end of the sale period, send between 1 and 3 emails to remind them of the stop time and drive immediate action. Your store is going to see a huge spike in traffic. A lot of that traffic is simply shopping around and looking for the best deal. They might have the intent to purchase something, but often, they’re not sure what that is and are simply waiting until a particular deal catches their eye. Your job is to make use of your site to really catch attention and draw the eye to your biggest, best deals. Here’s a great example of how to bring attention to your Black Friday deals form the eCommerce kings Amazon. You store will see a huge increase in interest and traffic, however, a good deal of those people will be first-time visitors who are only browsing. You’ve got to capture their attention and really hammer home the best deals and benefits so they stop and purchase instead of checking the next best Google result. Paid ads are a great method of driving targeted traffic to your site. According to Custora, paid search was responsible for 16.3% of orders in 2015. However, you’ve got to look beyond the basic of simply targeting those who tap in a Google search for “best Black Friday deals”. You’ve got to understand how different campaigns and strategies are going to best help you increase revenue. 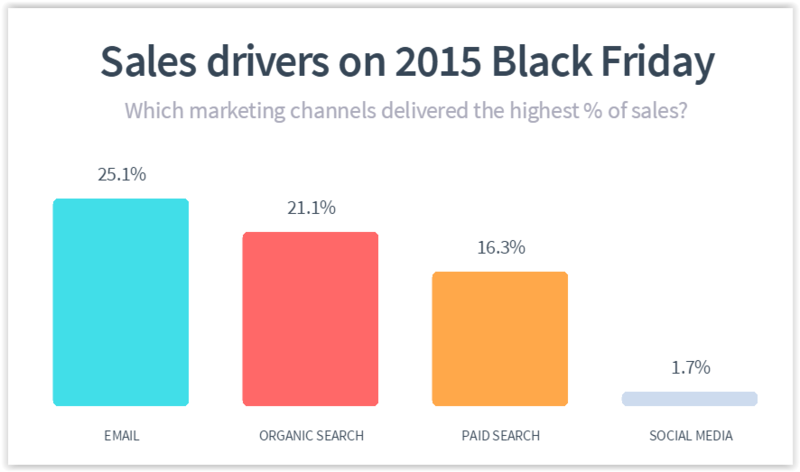 Whilst not a comprehensive list, I’ve cobbled together some tips for your Black Friday paid ad campaigns that will increase conversions from paid traffic. Keep the ad scent strong! Ad scent is basically ensuring there’s a continued theme and experience between ad copy and landing page. 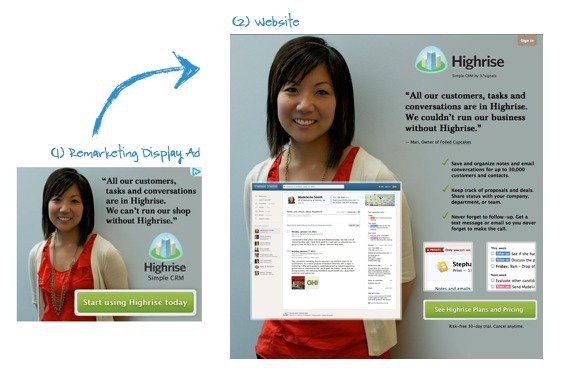 You have to keep the ad scent strong between ad copy and landing page for the best results, otherwise there’s a disconnect and you risk losing the user’s attention. If your ad says “Black Friday Sale 50% off all T-Shirts!” then your landing page should have the same or similar copy in the headline so it feels like a single, cohesive journey for the user. Ad scent also includes the design of your display network and social ads and how well they align with the landing page. There needs to be a similar feel between the ads and the landing page for that continuity. The below isn’t an eCommerce example, but it’s perfect to show you how to perfect ad scent. Anyone who clicks on the ad is going to feel like they’ve landed in the perfect place when they see the almost identical landing page. That’s the sort of ad scent you should be aiming for to increase conversions. Not everyone who visits your site is going to convert on that first visit. However, the visit itself is a huge indicator of interest. To make the most out of the 4 day sales weekend you should be setting up some remarketing strategies to bring those visitors who showed an interest back to the products they viewed. According to CMO.com, retargeting is one of the most beneficial steps you can take with your ad campaign achieving an average CTR 10x that of regular display ads, and increase brand searches up to 1046%. If a user visits a certain category, let’s say hats, then for the four day weekend they should be hit with display network ads that remind them of the hat offers. They obviously want one, so why not keep reminding them you’ve got just what they need? Everyone knows Black Friday sales are limited in time which is great for you because a little scarcity forces people to take immediate action. Most use countdown timers on site and within email promotions, however, you can also add a countdown to your paid ads through Google’s Ad Customizers. With ad customizers you can append a small countdown to the end of your ad to really drive immediate action. It’s a small change, but one that should help you drive even more attention and traffic. Thanks to its insanely high engagement stats, Facebook Messenger is becoming the lynchpin of many eCommerce stores’ conversion strategy. Whilst stats like those above are now commonplace, I don’t think this will be the year for Messenger to overtake email, simply because so few stores are using it. However, that’s an opportunity itself. With so few stores using Messenger to drive sales, those who do will easily outpace them in revenue numbers. If you’re tempted to experiment with Messenger then sign up for a free Recart account now to implement all of the above campaigns at the click of a button. Mobile first has become the mantra of conversion rate optimisation nuts across the globe, and with good reason. There are more mobile searches than on desktop now and, as a result, Google is starting to penalize sites who offer a poor mobile experience. You’ve got to make sure that your store’s mobile experience is optimized and enjoyable for users. Doing this is no easy feat, but as a start, these are the key steps you should be taking to ensure your site is mobile ready. 1 – Check how Google ranks your site. This can be done by following instructions after clicking this link. After inputting your domain, you’ll see a readout like the below with specific recommendations. Don’t be fooled by that big green mobile friendly notification though. You’ll want to click on the page loading issues at the top and check all the little issues that could affect speed and usage. 2 – Remove intrusive popups as they’re now on the Google list of things to penalize. If you want to read more about why and how to overcome the problems be sure to check out this article we put together that explores it in more detail. 3 – Test them yourself! Either get your team or someone you know to run through the site to run proper QA tests. Google might not pick up awkward wording or items that display incorrectly on mobile. You’ll need a human eye for that. Abandoned carts are an issue for stores year round. 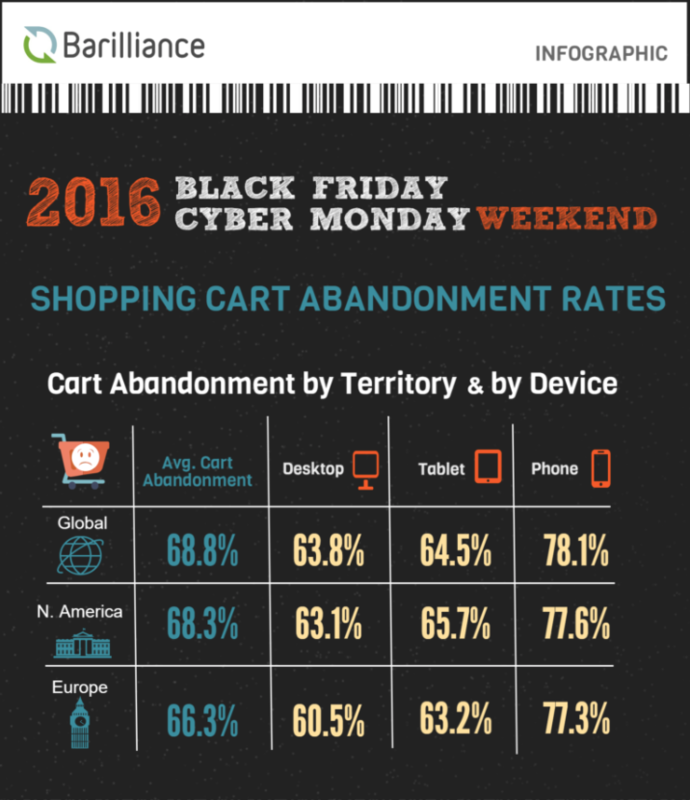 On Black Friday 2016 weekend alone, an average 68.3% of carts were abandoned. You should already have a robust cart abandonment campaign in place. However, you might need to make some amendments to it to really get the most out of it. The first thing to do is to implement a Messenger campaign. 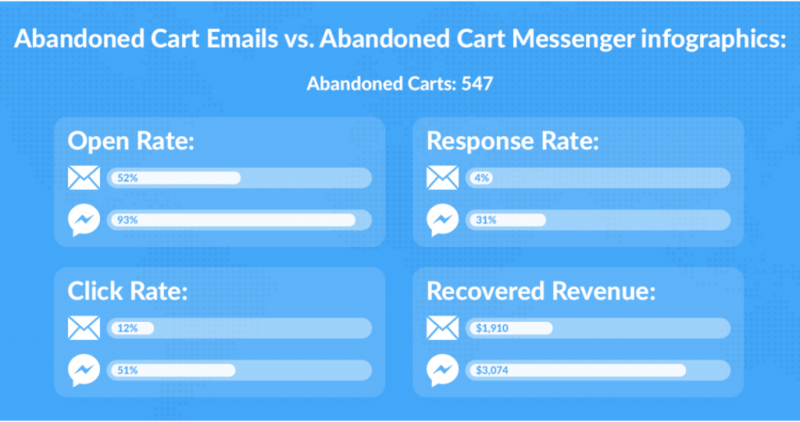 As I pointed out above, in our testing of email vs Messenger for cart abandonment campaigns we’ve found Messenger to be the far more effective channel. And with the “buy now” mentality of Black Friday that immediate engagement will probably help you out no end. 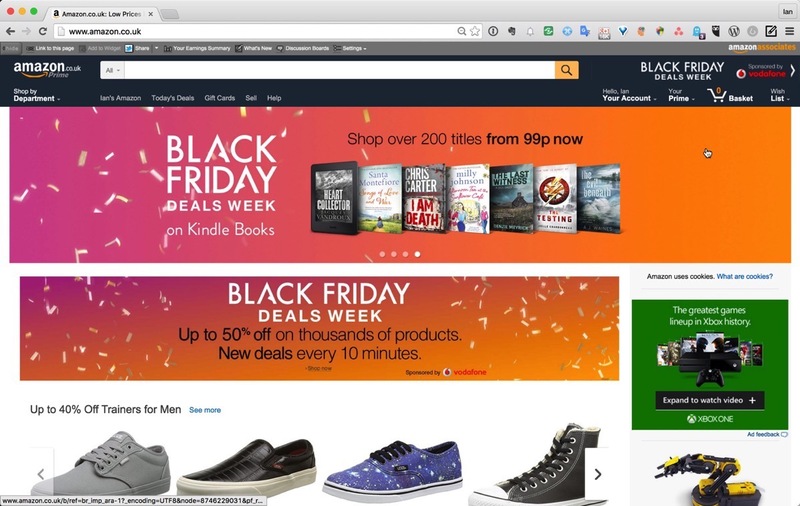 The second recommendation we have is to set up specific Black Friday cart abandonment campaigns. As a default, most services – including Recart – have timed cart abandonment messages that trigger up to a few days after the initial abandonment. However, your sale will run for between one and four days so you’ll want to amend not only the timing but also the copy to better reflect this. Make mention of when the sale price ends, how much the item will return to, and really drive for that immediate action for the best results. User interaction is going to go through the roof over Black Friday weekend. It’s a great time to gather some data on user action and draw up a plan for overall site improvements and to get ready for the next big rush in the run-up to Christmas. Make sure you’re tracking anything and everything for the entirety of the customer journey. Before Black Friday rolls around you want to make sure you have at least the below set up to gather data for you. The combined information form these will help you better optimise your store for future gains. Don’t Forget to Follow Up After the Black Friday Weekend is Done! Black Friday through to Cyber Monday might only be four days, but you’re going to collect a huge amount of data on your customers over those four days which could lead to increased revenue across the year. You’re going to have new subscribers, new customers, and more data on existing customers all telling you what it is they want and need in their lives. You’ve got to continually follow up with these customers throughout the year to really maximise the amount of revenue that can be made through relevant cross-sells, up-sells, and future promotions that may bring them back on site. If you want to automate much of your follow up be sure to sign up for a free Recart account and we’ll help take some of the biggest revenue driving tasks off your hands so you can sit back and watch the money roll in.